Example: If you have board named as Movies, Create different sections inside this board as action movies, horror movies, comedy movies, Drama, Thriller etc. How to Add Sections in Pinterest Boards? It is rather easy to signup with Facebook. I would recommend last two options. Click on your profile pic in the right top and go to your Pinterest profile page. You can see the slider of my Pinterest profile page, you can add only 5 of your favorite boards into this slider to improve the visual appearance for your profile page. Here's another tip: Use a unique design for all your boards cover photos. It will also be eye catchy. Now don't worry about how to create a cover photo design for your boards, Really its very easy, Visit canva.com ,Create a free account and start designing your dream design. Canva is the best tool available in online which allows many features for free account holders. Select which board you want for more optimizing, In my profile I chose "Cameras" board. I think its very good to create additional sections in camera like company name, models, user friendliness and more. This is time for creating something better!!! You can only see this "Add section" as an option in non group boards. I hope Pinterest will update this in the near future, this feature will really increase the chance in group boards. I have given a name as New Models-1 for this demo post. You must give section name as something creative or basic. No problem its your board your choice!! 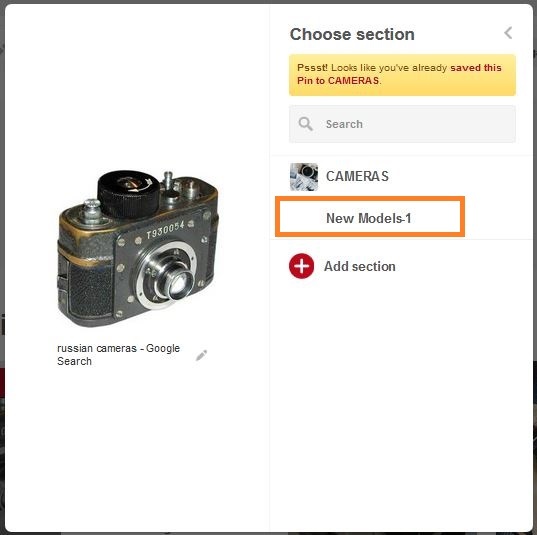 Now you can see the newly created "New Models-1" section in "cameras" board. 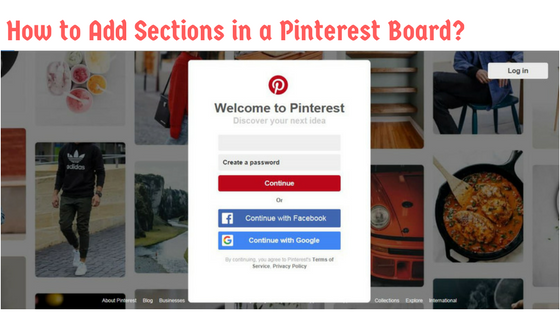 How to Save Pin in Sections Under a Board in Pinterest? You have defined a section in a board, Now how to save a pin to that section. Its really simple as before but some small changes/additional steps. You can clearly see a the character I marked in the above image. Its to open the board further. Provide suitable captions/descriptions for your pin before saving it. You can see my newly added section "New Models-1" under camera. 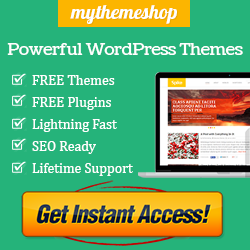 This feature will increase your chances to showcase your business related pins. This will improve the way your boards visual presentation. You can arrange the pins according to a secondary topic under a primary topic. Encourages more people to follow your profile.